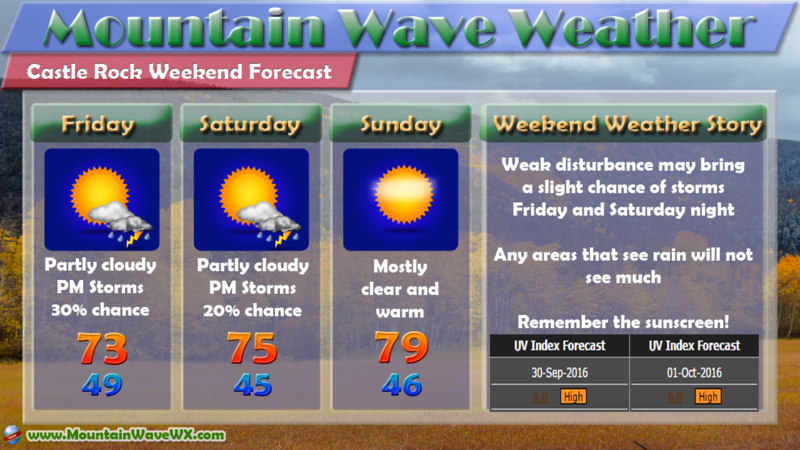 A very typical fall weekend on tap for most of the region this weekend. Most of the areas in and around the Palmer Divide region will see partly to mostly sunny skies with light winds. Overnight hours will still be a bit cool but we don’t see a lot of cold air in the region for the next few nights. For other regions around Colorado; the mountain areas will be warm and mainly dry but some storms may form in certain areas West of the divide. Meanwhile on the plains; look for mostly sunny skies and warm days as well. There are chances for storms out East, but the overall threat looks low at this time. We are keeping a close eye on a big weather change early next week. Look for an update on that later in the day Sunday here on our site or Facebook. Possibility of pretty decent snowfall exists in the mountains at this time but the plains look to remain dry unfortunately. This many days out, things can still change so that’s why we’ll keep a close eye on it and pass along any updates. We are still seeing a high degree of uncertainty with models across the board so a forecast is not worth at this time, just be ready for some changes early next week!